Anne Royall was an American original, a stranger to fear who defied 19th century skeptics as a prolific literary force, satirist and social critic. 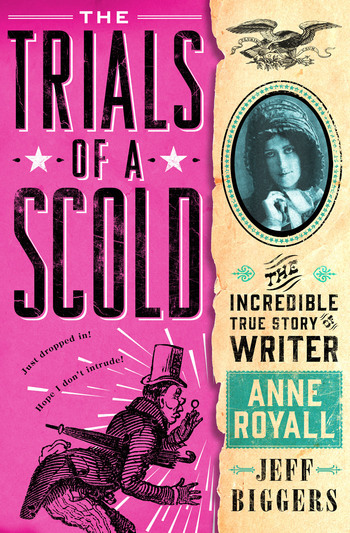 Drawing from Royall's largely overlooked literary works, Jeff Biggers's Trials of a Scold is a groundbreaking and passionate biography of Anne Royall, America's first female muckraker, who was convicted as a "common scold" in 1829 in one of the most bizarre trials in the nation's history. Publishing her first book in 1826 at the age of 57, Royall reinvented herself as a “women politico” a generation before the Women's Suffrage Movement. She was a pioneering travel writer and satirist who broke ground on the wagon trails a generation before Mark Twain, and an investigative journalist who took on bankers and prison conditions a half century before muckrakers Ida Tarbell and Nellie Bly. She was the author of 10 original books, and publisher of a newspaper in Washington, DC for 25 years until the age of 85. One of the most famous, sharp-witted and controversial women of her times, Royall was raised in the backwoods of the South but educated herself in one of the great libraries in the region. She openly cohabitated with her husband prior to their wedding, but was then left widowed and destitute after her husband’s family declared their marriage invalid. Turning to writing, Royall acquired fame and then enemies for her scathing and hilarious denouncements of corruption, incompetence and the blurry lines between church and state. JEFF BIGGERS is an American Book Award-winning journalist, cultural historian and playwright. He is the author of several works of memoir and history, including Reckoning at Eagle Creek, which was the recipient of the David Brower Award for Environmental Reporting. His award-winning stories have appeared in The New York Times, Washington Post, The Atlantic, and on National Public Radio. Biggers is a regulator contributor to Al Jazeera America, Huffington Post, and Salon.